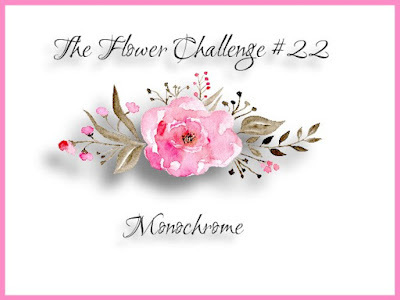 Hello dear blogging friends: The new challenge over at THE FLOWER CHALLENGE is all about MONOCHROME, you can use any color and the shades of that color on your cards, you can use black or white as an option and to stamp your sentiment. Anywho, here is my card for the challenge, I hope it inspires you to create a card using perhaps your favorite color and join my teammates and me in the gallery. This image is from a Power Poppy set called Countryside Bouquet Delux and I chose to use all kinds of pink shades on it. I saw THIS VIDEO on Pinterest and decided to kind of CASE the card, which is really beautiful. I added a few highlights and shading with a couple of Prismacolor pencils and a few Rhine Stones for bling, the corner die cuts, I found a piece of ribbon, that happens to look exactly as the colors of distress inks I used for the card in a bag where I save the last pieces from the spools, the sentiment was a leftover from another card, the pattern paper is from a discontinued line from Lili of the Valley. The images and sentiment are from the same set. 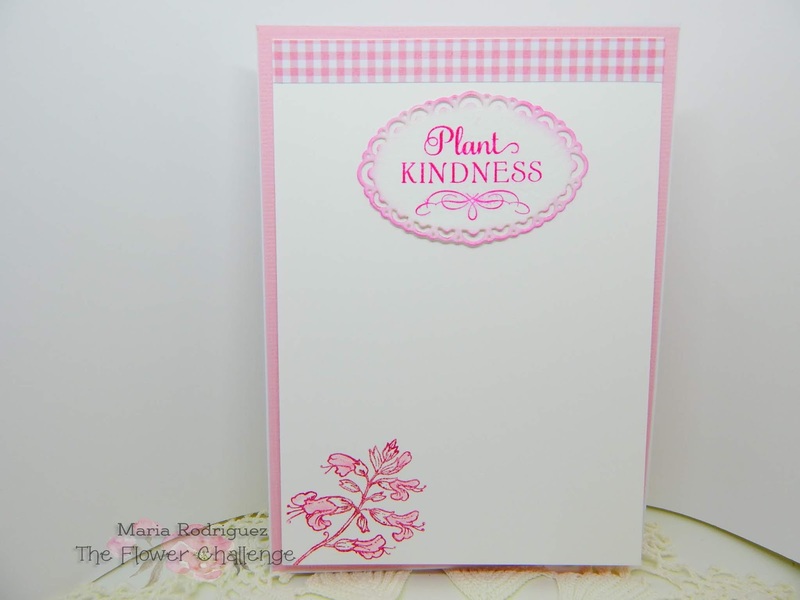 I hope this card will inspire you to come and play along with us at THE FLOWER CHALLENGE, for more inspiration, please stop by the challenge to check out my awesome teammates' beautiful cards and check out their blogs to find out how they created them. Please don't forget to include our banner for this challenge on your blog post when you link your card to the page and please also remember you can enter only 6 challenges including ours. Incy Wincy Designs for July, FLOWERS. Hello everyone: A new challenge is on at the SHOPPING OUR STASH blog and we hope you can find a bit of time in your Summer activities to play along. The theme is GEOMETRIC FIGURES, so get your circles and squares, rectangles and triangles, or whatever other geometric figures you have in your stash and join my teammates and me in the gallery. This is my card, hope it inspires you to play. As you can see, there is minimum stamping on this card, I just punched the Hexagons with a retired SU punch out of all of my Lili of the Valley scraps, taped them together and for the middle, I added a die cut circle I had in my stash of leftovers, then added some "stitching" with a gray marker. I glued this "quilt" to a doily and stamped the sentiment on a banner I had also already cut. The background pattern paper is from Lili of the Valley. 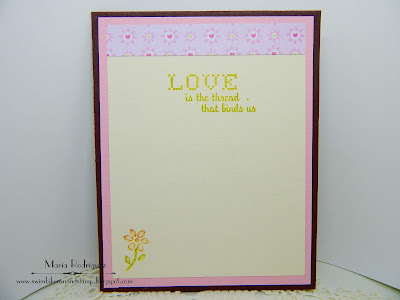 Both the sentiment and the little flower are from the same set. I hope you join us in the SHOPPING OUR STASH gallery, we can't wait to see what you create. 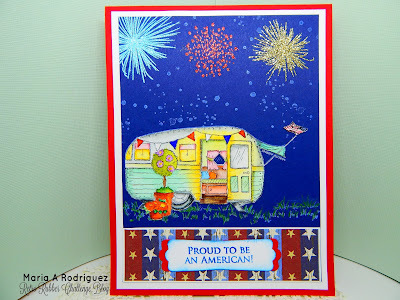 Please visit the blog to admire my teammates' fabulous cards. Hello crafty friends: I had so much fun creating this card that I'm so glad the day arrived to share it with you today as inspiration for the RETRO RUBBER challenge, I hope you find some time to join my teammates and me in our gallery. 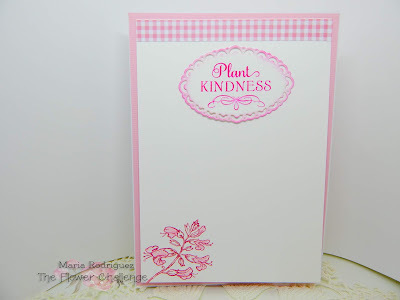 I have this super old stamp set from Flourishes (sadly discontinued) that dates back from 2013 when it was finally released, I couldn't wait to buy it and I did as soon as it was available, tee hee!! The images are simply adorable, as you can see here with this sweet and vintage RV camper trailer. I love every detail on this image and I placed it on a warm Summer's night, with a starry sky and fun and festive Fireworks to celebrate Independence Day. I stamped this image on watercolor paper with Stazon black ink and colored it with SU markers and ink pads, I love the glow that I was able to achieve coming out of the little door. Then I fussy cut it and placed it on the panel after I stamped it again with white ink to have the grass under it, I just colored the pole holding the little awning with a silver gel pen and then, using part of an image from another Flourishes set called "Patriotism on Parade", I stamped the little American Flag, colored it and fussy cut it to place it on top of that pole, I was amazed how perfect the size was. The fireworks are from a The Ton set called PYROTECHNICS and they are heat embossed with glitter embossing powders. The sentiment is from a retired SU set called "Perfectly Penned", the image on the bottom form the Flourishes set. So I hope you get inspired to come and play along with us at RETRO RUBBER, please make sure at least one of your stamps is older than a year, we would love to know it's age. Stop by the blog to check out my teammates' amazing creations and then, play along with us, we can't wait to see what you create.